Founded in 1999, we have are the tree service Appleton and Fox Valley have depended on for all their tree care needs. Our team of tree care professionals possess the experience and knowledge to both take care of your trees and also how your trees as they fit into your in property's overall landscape. We take the time to professional care for your trees so they are an asset - not a liability - in your landscape. Moreover, we are licensed, bonded, and insured offering our clients with the utmost in safety and protection when it comes to working on your trees. Call us whenever you need professional and affordable tree care. Appleton Tree Service is a locally and family owned and operated tree care business located in the heart of Appleton, WI. We employ the best tree care professionals who are background and drug screened. We have to lowest turnover rate among our competitors at only 15% annually and are proud to have a staff with a combined 81 years of tree care experience. You can trust and depend or team for all of your tree care and snow removal needs. We offer a complete range of tree care and snow removal services. We provide fast free estimates, usually within 24 hours of when you contact us; and, all of our quotes are provided in writing with copies of our licensing and insurance information. Below are a summary of some of our most popular tree and snow services. Trees need to be removed for any number of reason: storm/wind damage, pests, disease, aesthetics, and safety. A tree may be dying or dead causing a potential safety issue to your business or home. Perhaps it is be diseased and should be removed due to it becoming ugly and potentially dangerous. Wind and storms can often cause tree damage requiring them to be cleaned up by removing. From a landscaping perspective, trees can easily become overgrown causing a landscaping problem with lawn and/or and planting, such as creating too much shade. Finally, trees should be regularly trimmed or sometimes even removed due their close proximity to your home or business structure. We can affordably and quickly remove any tree for any reason. Large tree removals should be done by knowledgeable professionals due to potential hazard to nearby property structures and the people performing the work). Uninsured and Unlicensed tree care companies create risk for themselves as well as liability to the home and business owner. If a tree company working on your property are not licensed and insured, an accident can create a large financial liability for the home or business owner , that you insurance policy will have to cover by law. Please do not use a tree contractor that is not fully insured and licensed. 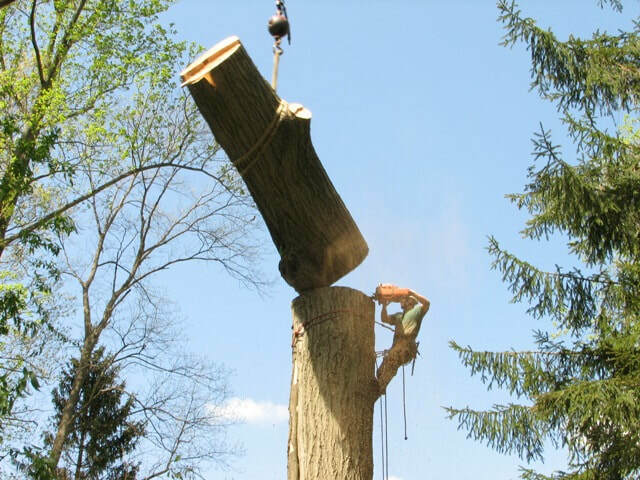 Tree removal can be safe, relatively simple, and affordable if done by a skilled professionals. Call us for a fast free estimate on any tree(s) removals you need. We are always happy to service you. Tree trimming and tree pruning, which is a lesser form of trimming) can make a big difference in the beauty and overall health of a tree. Done wrong, tree trimming can cause a it to look unsightly and even lead to premature death. Please do not employ a tree contractor in Appleton that is inexperienced and unskilled in the science and are of tree trimming. If you glance around your Appleton or Fox Valley neighborhood you will note that over 90% of the trees in people's lawns are untrimmed. Most business and homeowners allow their trees to over-grow causing an unsightly appearance as well as being potentially dangerous. Don't be that neighbor or business owner - if you trees are properly trimmed they can be a great asset in your landscape. While winter is the best time to trim trees, it can be done in any season. In the winter you landscape lays dominant so the possibility for damaging your lawn and nearby plantings is almost eliminated. Moreover, the entire structure of the tree is visible so trimming can be performed more holistically. Regardless of the time of year, trimming your trees can have a critical impact on their health and aesthetics. Grinding or removing at stump is the next common step after removing a tree. Most stumps are ugly and hamper landscape and yard care effort. 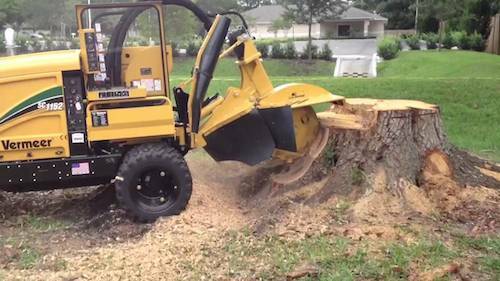 There are several method to eliminate a tree stump: grind it down below the surface, causing it disappear so you have room to plant over top it it; or, excavating it out of the ground by removing it and the root system with a backhoe. Due to damage to the surround area when using a backhoe, tree stump removal is usually only performed in situations where foundational or road work will be completed. For virtually all purposes, stump grinding is the best common choice. Most stumps should be eliminated, not only for lawn and landscape purposes, but also due to the fact they can become dangerous as they often harbor biting insects, such as wasps, ants, termites, etc. We have the finest stump removal machines that can make easy work out of any sized stump, renewing your lawn and landscape. While the effort can be a bit dirty and messy, we always take precautions and time to reduce the effects of grinding a tree stump. Grind a stump can be done in 45 minutes for older, small stumps to over a 2 hours for new, large stumps. However, irrespective of the age and size, we provide fast and affordable stump grinding that will return your lawn and landscape to pristine conditions. Trees can be damaged by the strong hail and wind brought on by storms. The result can be both dangerous and damaging to your trees and home's appearance. We provides around the clock tree care for trees damage caused by storms - we know the dangerous situations they cause. When power lines are brought down due to damaged branches and uprooted trees, please call the professionals to effectively and safely remove them, supporting the electrical company in restoring your electricity. We provide this emergency tree care 24x7 because we know our customers require tree storm damage cleaned up safely, quickly and economically. Call us any time night or day when you are have this unfortunate situation on your property. We offer brush removal and wood chipping services when you have tree debris that needs cleaned-up. Often times property owners perform extensive tree and shrub trimming on their own only to discover an inordinately large amount of branches, limbs, and other tree/shrub debris needs to be dealt with. For many property owners, without legal disposal resources, this can be a nightmare to deal with. Consequently, as the tree service Appleton trusts, we offer affordable wood chipping and brush removal services to aid you in ridding your landscape of this debris. Call today for a free, often same day, estimate for any wood chipping and brush removal you may require. We are also proud to provide residential and commercial snow removal. We operate a number of snow plow trucks that can quickly clear commercial parking lots and residential driveway. We augment this equipment with snow shoveling of your paths and walkways. We provide these snow removal services both on contract for the season as well one an individual job basis. We operate our snow removal business virtually 24 x 7 and seven days a weeks during peak winter months. No job is too large or too small.